I've written about the work of architect Jay Waronker before. since 2009, Jay has been the recipient of several grants from the Koret Foundation sponsored by ISJM for his work to document synagogues in Kerala (India), and to and promote their protection and preservation. Jay and his colleague anthropologist Shalva Weil have an article about the Parur synagogue in the February 2012 issue of The Jewish Magazine. Waronker has previously written about the synagogue in The Journal of Indo-Judaic Studies #11 (2011). 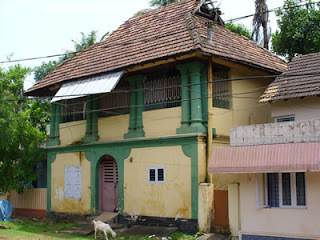 The site is very rich in descriptive, historic and analytic content and photos of Cochin and Kerala's many synagogues. There is also an extensive bibliography. In the architecture section Waronker writes at length about seven standing synagogues as well as lost synagogues of Kerala. Many people may have heard of the Jews of Cochin (today Kochi) in southwestern coastal India, but far fewer know that there were in fact other small Jewish communities over the centuries in this same region of the country, each revolving around a synagogue. Eight such buildings, all located in the central part of the State of Kerala, survive in some form today. The most famous of these synagogues is the Paradesi synagogue in Jew Town, Cochin, with its low clock tower and blue and white willow-pattern tiles imported from China paving the sanctuary floor. In 1968, Prime Minister Indira Gandhi attended its quartercentenary celebrations, and the Indian government issued a special commemorative stamp on the occasion. Today, there are only nine Paradesi ("foreigners") Jews left in Jew Town, and a Chabad rabbi conducts the services, pulling in Israeli backpackers and American and other Jewish tourists to make up the minyan. In the 1990s, the interior of another synagogue, the Kadavumbagam, located just down the street from the Paradesi Synagogue was brought to the Israel Museum in Jerusalem and is a great attraction in the newly-opened museum. In Ernakulam, the commercial center of Kochi, two former synagogues remain but are no longer functioning houses of prayer. The first, the Kadavumbagam on Market Road, is now operated by a Jewish business owner as plant nursery and fish shop, and the other, the Tekkumbagam, is around the corner on Jew Street behind a locked gate. Heritage plaques have recently been affixed to both these synagogues by the authors of this article identifying them as Jewish sites. Buffalo, NY. Former Ahavath Sholem synagogue. A. E. Minks and Sons, architects (1903). Photo credit: David Torke, fixBuffalo. Click here to see more photos. 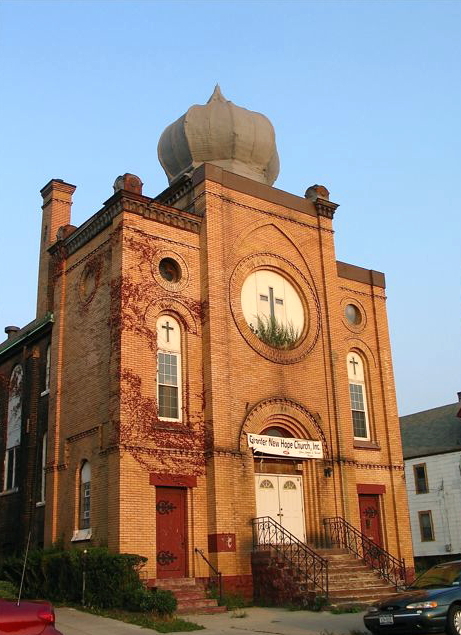 (ISJM) The former Ahavath Sholom Synagogue at 407 Jefferson Avenue in Buffalo (google map), built in 1903, is threatened with demolition. Jewish use of the building ended in the 1960s, and it became home to the Greater New Hope Church of God in Christ. The structure is now empty and in disrepair. 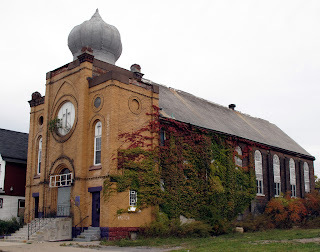 The building is one of the last standing synagogue of the "facade-dome" type that was popular at the end of the 19th century. Architecturally, the building is most readily notable for its single 'onion' style dome set over the central entrance bay of the facade. Variations of this type of arrangement are known in synagogue architecture beginning in Europe in the mid-19th century. 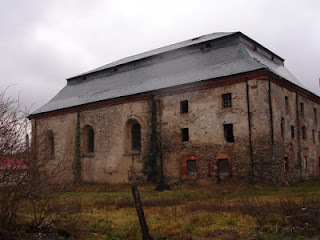 One example is the destroyed synagogue of Jelgava, Latvia. The style was especially common in Moorish style buildings such as Ahavath Sholom. Major American examples include Temple Sinai in Chicago (Dankmar Adler, arch.) and Temple Beth El in New York (Brunner & Tryon, archs.) which were demolished decades ago. Tiny Gemiluth Chassed in Port Gibson, Mississippi survives. Time may not be long for Buffalo's Ahavath Sholom, but local efforts to save the building may stave off the wrecking ball. Port Gibson, Mississippi. Congregation Gemiluth Chassed (1891-92). Photo: ISJM. Jelgava, Latvia. Former synagogue (1890?) from a postcard. I'll be writing more about the plight of the former Ahavath Sholom and the effort to save it soon. Meanwhile, look at this extensive flickr series of photos of the current condition. Views of original building blueprints are included. From these you can see that originally more Moorish details had been planned. In December, Housing Court Judge Patrick Carney issued an order to demolish the City's oldest synagogue, one of the last remaining vestiges of Jewish life on the City's East Side. The familiar onion domed landmark on Jefferson Avenue was designed by A. E. Minks and Sons and built in 1903. With the cooperation of Rev. 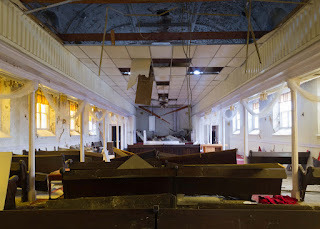 Jerome Ferrell and his congregation, the Greater New Hope Church of God in Christ, this historic structure was designated a local landmark by the City's Preservation Board in 1997. You can read more about the synagogue in this article by Chana Kotzin from the February 10, 2012 issue of the Buffalo Jewish Review. Kotzin runs the Buffalo Jewish archives and has been collecting history about the building, its congregation and the old East Side Jewish neighborhood. The synagogue was designated a local protected site in 1997, but that did not lead to its restoration. You can read here the entire local landmark designation application from 1997, made available for wider distribution on fixBuffalo with Tim Tielman's assistance. The building is clearly eligible for National Register listing, and preservationists plan to submit a nomination form to the state soon. NR designation can be crucial for qualifying for a variety of government sponsored grants and tax credits for any restoration or redevelopment project for the building. My thanks to Cynthia Van Ness and David Torke for helping me with this entry. 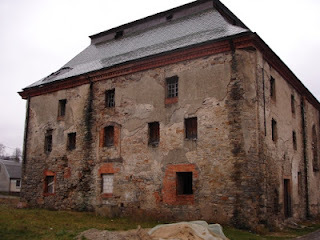 (ISJM) The Wielkie Oczy Foundation, Inc., created by survivors and descendants of the Wielkie Oczy Jewish community, have posted several videos of their ongoing efforts to restored the ruined synagogue to be a library for the town. The buildings was once a handsome, spacious and well proportioned structure. It now has a new roof, windows and rebuilt and plastered exterior walls. The synagogue was built in 1910 and damaged during the First World War. It restored in 1927 through the generosity of Eliahu and Rachel Gottfried of New York City. Once again a tresotragtion campagin is underway, though now, since there are no Jews in the small town, it will be refashioned as a library memorial. You can tour of the synagogue as it looked in the summer of 2003. You can see a new video here, a fragment from a larger work in progress, shows the progress of the restoration. The Wielkie Oczy Foundation, Inc. a U.S.-based not-for-profit 501(c)(3) corporation that is contributing to this restoration by supplying materials and funding for a permanent memorial to the members of the Jewish community that at one time, up until the Holocaust of the mid twentieth century had been part of a diverse religious and ethnic population in the village and surrounding area. The Jewish community was decimated; survivors spread far and wide across the globe. This memorial will be housed in the library. The Foundation has put out a call for old photographs of Wielkie Oczy to be used in the video documentary, They are particularly interested in early photographs of the Beit Hasmidrash (or House of Study that was destroyed in 1943), the synagogue, the Jewish cemetery and any old photographs of Vilkocher Jews and their life prior to World War II. The period between Ausgleich and Holocaust (1867-1939) witnessed the rapid modernization of Galicia, and especially its metropolis, Lwow/Lemberg/Lviv. Citizens of the Austro-Hungarian Monarchy, and then of the Second Polish Republic headed in a diversity of paths, leading from the segregated traditional societies towards the modern integrated one, and at the same time, to a number of nationalist perspectives. These uneasy political and cultural conditions presented challenges for every group, and especially for their creative individuals, the artists. L'viv, Ukraine. 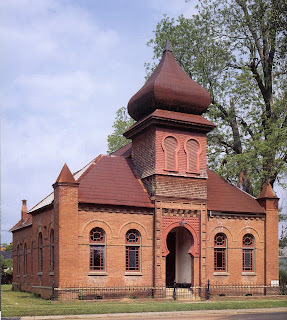 The Temple Synagogue (from postcard). Liwicki, architect (1840-46). The conference focuses on artists and architects, who defined themselves or were defined as Ukrainians and Jews, and thus were the representatives of the two largest non-dominant groups in Lviv before World War II. Their modern identities were shaped, in respect or contrast to, but almost always in the context of the Polish dominance in the city, and - from the last third of the nineteenth century - in the context of Polish national resurgence. Ukrainian and Jewish artists were haunted by stereotypical views and self-views, both similar and dissimilar: while none of them had had any "national art," the former were known as indigenous builders and artisans, though confined to the peasant's background, the latter as "an artless people," "isolated in ghetto for centuries." For some artists it was an existential choice to acknowledge or oppose the stereotypes. Another artists' challenge was the ubiquitous modernization, reflected in the diversity of available concepts, whether evolutionist, "renaissance," or revolutionary. How artists constructed their artworks, their selves, and their group affiliations in relation to this changing world and specific urban environment, will be the topics of the conference. We invite scholars to present their studies of artistic and professional strategies within the highly prolific Ukrainian and Jewish communities of artists and architects. We invite papers questioning how artists and architects articulated their belonging to different groups, how this influenced their work and their social position, how interaction with other artists in the multi-ethnic environment of the city have influenced ideas and concepts of art and its role in society. Moreover, we would like to learn how the social position and perception of artists and architects varied in different ethnic communities, and how they changed over time. While individual papers may only focus on the artistic life and architectural practices within one community, Ukrainian or Jewish, we aim to bring a comparative perspective by inviting scholars to discuss narratives and strategies of these two groups together. We hope for insights in three chief directions: making and socializing the art; retaining, constructing, and re-constructing bonds with the ethnic-religious groups; shaping the cultural elites by non-dominant groups.We also invite papers dealing with the question of interaction between the urban environment and artistic milieus. Inquiries into the role of Lwow/Lemberg/Lviv, but also perceptions and reflections of the city by Jewish and Ukrainian artists and architects are thus especially encouraged. 1. Emancipation and education: artists, architects, and engineers. 2. Individual professional activity and career: graphical arts, painting, sculpture, photograph, decorative art, architecture and engineering; interaction of arts; religious and secular art; funerary art. 3. Architectural presence and visibility in the cityscape: representation of minority in modern city; leaving and retaining the frameworks of the traditional environment. reaction to the numerus clausus restrictions. 6. Artistic and professional milieus of a non-dominant group: professional unions; associations; exhibitions; competitions; art critics; press. 7. Supportive communities: welfare and social care, from orphanages to academic houses and spas. 8. Art collecting and patronage. Private collectors. Jewish Museum and National Ukrainian Museum. Libraries. 9. Circles of identities: local, imperial, national, and universal identity. Loyalty and nationalism in art. 10. Relations with the "others": tutorship, co-operation, sympathy, competition, and separation. 11. Prejudices in the realm of art, architecture and beyond: anti-Semitism, ethnic and religious discrimination. 12. Constructing "national styles": defining Jewish and Ukrainian art and architecture. 13. Destiny of Jewish artists and their works in Holocaust. Ukrainian artists and architects in the wars and under occupations: World Wars I and II. 14. Post-Lviv/Lemberg/Lwow stories: artists and architects outside of Lviv. Languages of the conference: English and Ukrainian. available. No conference fee will be charged. This will surely be a day of interesting discussion...unfortunately the schedule doesn't go into more detail about specific topics. A day-long symposium exploring arts-led urban development and the role that Jews play in envisioning new forms of urban life. Free and open to the public. Temple University's Feinstein Center for American Jewish History brings together scholars and urban practitioners to consider the public and private forces that shape urban art and culture. The culminating event of two years of programming on "Jews and the American City," this symposium invites the public to join in conversation with some of the most important urban thinkers today. 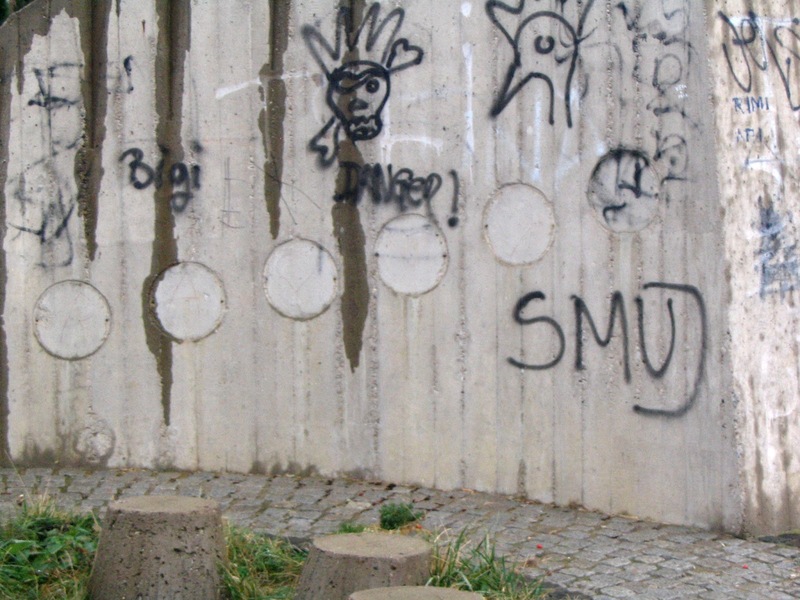 How are Jews imagining, funding, and creating urban arts and culture for the future? Rachel Chanoff, Founder and Director, THE OFFICE performing arts + film, and Artistic Director, Celebrate Brooklyn! Now that the restoration of the synagogue in Zamosc, Poland is complete, the Foundation for the Preservation of Jewish Monuments in Poland (FODZ) is turning its attention to the great synagogue of Przysucha (Yiddish: Parshishe vel Przishe). 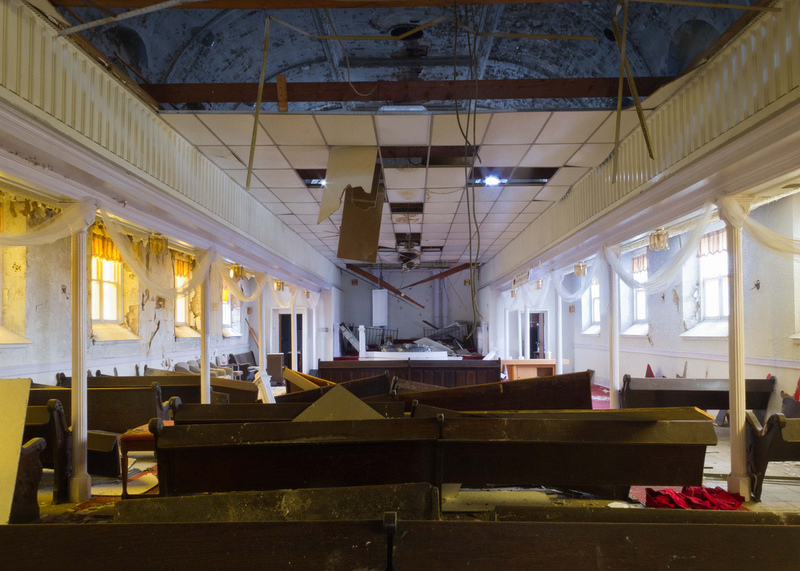 FODZ has begun efforts aimed at revitalizing the 18th-century synagogue into a vibrant cultural center to serve the needs of the visiting Jewish groups and the local community. 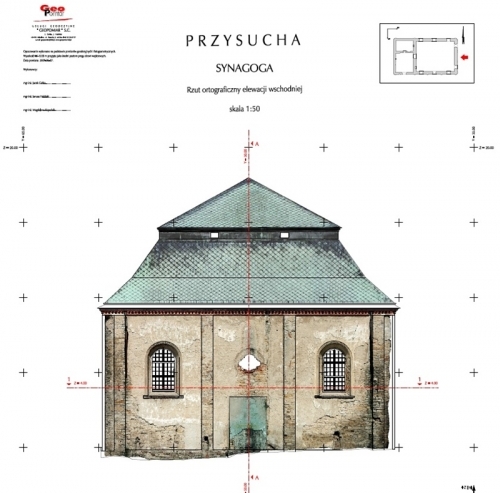 Even if you cannot go to Poland, you can get a good sense of what si left of the structure from a virtual walk through the 18th century synagogue in Przysucha. 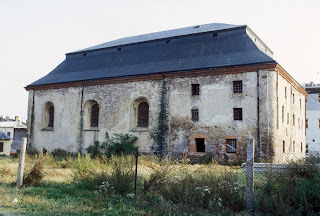 The big masonry synagogue was built between 1774 and 1777, during a period when Przysucha was an important center of Hassidism and gained considerable renown for its tzadikkim (religious leaders) Abraham of Przysucha (d. 1806), Jacob Yitzhak ben Asher (1766-1813), known as the Holy Jew of Przysucha and credited with being the first propagator of Chassidism in Central Poland, and the latter’s disciple Simcha Bunem (1784-1827). Their ohelot (small structure protecting their graves in the Jewish cemetery), were (re? )built in the 1980’s are regularly stops for Hassidim religious pilgrims. FODZ took ownership of the long neglected site in 2007 and the following year carried out protective renovations. The building, however, still needs urgent repairs. In December 2009 construction and conservation documentation was completed, and FODZ can now apply for European Union funds to start the restoration and adaptive use work. Private funds will also be needed for significant parts of the work. The massive limestone synagogue has an area of 650m², and it towers over the small town (current population: 6800). The rectangular prayer hall has a vaulted ceiling that descends in its central part on to the four-piered central bima (reader’s podium). A typical example of the once-common Polish 'bimah support' masonry synagogue. The aron ha-kodesh (Ark) niche in the is framed by a portal topped with stucco griffins. The synagogue originally would have had brightly colored wall decorations. A few fragments are preserved on the walls. ended and were mostly forgotten. Only the synagogue survived as an abandoned ruin. There were some unsuccessful efforts at restoration undertaken in the 1960s and in 1970, including repairs to the roof, but overall, the building condition is very bad will need extraordinary measures to make it whole and useful once again. I do not know how fine a restoration is planned. I would propose that the space not be over restored, but left with some of raw ruined appearance. No need to replace lost decoration here. Better to let the bones of the building speak. Its a fine big space and can serve many uses, inclusion exhibits, concerts, lectures and prayer. Contributions can be made to FODZ towards this work. For more information visit the website of the Revitalization of the synagogue in Przysucha project. In response to several requests from the United States, DefendingHistory.com this week asked three separate Westerners who found themselves in Vilnius, the Lithuanian capital, to try to see the “Flame of Hope” monument, by sculptor Leonardo Nierman, in memory of the victims of the Lithuanian Holocaust, located in the heart of the Old Town, in a yard that was in the Vilna Ghetto between September 1941 and the ghetto’s liquidation three years later. The story of the monument got underway nearly thirty years ago when the idea first came to the person who made it happen, Shelly Rybak Pearson of Florida, USA, who contributed a DH.com comment piece on the subject last December. The seemingly interminable saga has been the subject of a number of American media outlets, including a feature article in the Palm Beach Post and a television interview for the Miami Herald. For many years, the Lithuanian Embassy in Washington DC and the American Embassy in Vilnius have participated in the conversation concerning the monument. Discussions in different periods have dealt with agreeing a text for the inscription (see box at the end of this article), the venue for the monument, and above all — accessibility of the monument to the general public, Lithuanians and foreign visitors alike. 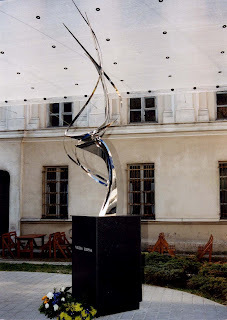 What is agreed by all sides is that the monument is located in the courtyard of the building that housed one of interwar Vilna’s prime Jewish educational institutions, the Yídishe reál-gimnàzye. During the Holocaust, the building tragically became the headquarters of the Nazi-established Judenrat, or “Jewish authority” within the ghetto. Like the other ghettos in major Lithuanian cities, the Vilna Ghetto continued to incarcerate the shrinking remnant of Lithuanian Jewry for several years after the majority were shot in the summer and fall of 1941, mostly by local perpetrators volunteering to kill the civilian Jewish population for the Nazis, at hundreds of mass grave sites across Lithuania. Texas Jewish history expert Donald Lee Teter died in Houston on January 26, 2012, at 86. Don was a founder of the Texas Jewish Historical Society and the Baytown Historical Museum. Over many years he organized efforts to locate, describe and preserve Jewish cemeteries, synagogues and other historical sites throughout Texas. I first met Don in the late 1980s when I was researching the history of the B'nai Abraham Synagogue in Brenham, Texas, of which my great-grandfather was a founder. Don also was an expert on the Jewish history of Baytown, where he had worked as chemical engineer after graduating from Rice University. His 2008 paper "OIL GEVALT: The History of the Baytown, Texas, Jewish Community, 1928-2008" can be read here. I followed Don's work in Texas throughout the 1990s. When I was collecting information on abandoned Jewish cemeteries in Eastern Europe, Don was doing the same for Texas. Together with his wife Gertrude, to whom he was married for 63 years and who survives him, Don compiled the massive Texas Jewish Burials, published by the Texas Jewish Historical Society in 1997. 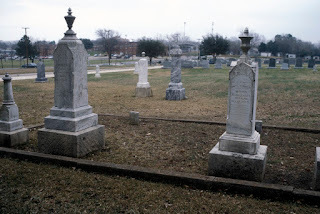 The 448-page book includes information on all Jewish burial grounds in Texas, including consecrated Jewish cemeteries separate from any other cemeteries, sections of non-sectarian cemeteries consecrated and dedicated as Jewish cemeteries and Jewish burials in non-Jewish cemeteries. The Teters collected the name and birth and death dates for each burial they and their colleagues located. 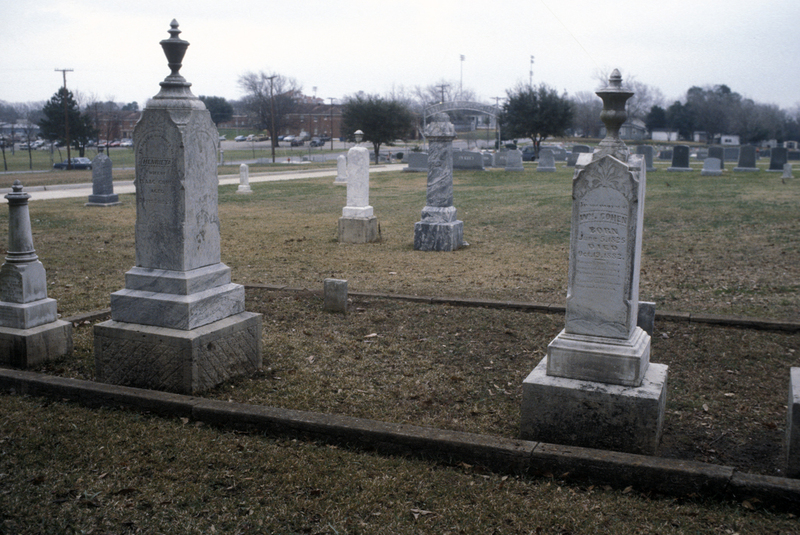 From this survey work developed many subsequent programs for cemetery clean-ups, sponsored by synagogues and other religious and civic groups. Don Teter will be missed by his large family and circle of friends. For his warm spirit and abundant energy, and because of his work in Jewish history, heritage and community; he will be long remembered. Donations in Don's memory can be made to Congregation K'Nesseth Israel, P.O. Box 702, Baytown, TX 77522 or other charity of your choice. Virtual Shtetl reports that the extraordinary monument memorial at the former Belzec Nazi death camp in southeast Poland is among 15 structures in the running for an award for the most striking masterpiece of Polish architecture built in the past two decades. The competition is sponsored by the Polityka weekly and readers can vote for their choice online. 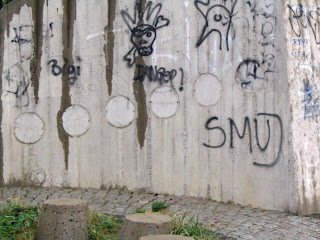 To read about the Partisans' monument in Pristina, Kosovo, see my blog Public Art and Memory.